Photo: Bigger than it looks. Located 16 kilometres north of town, the refreshing Punyaban Waterfall is easy to access thanks to a location right next to Route 4. Browse places to stay in Ranong on Agoda.com. Free cancellation. Clear mountain water cascades down a steep 20-metre cliff into a few pools that are suitable for wading, but not the backstroke. Kids can slide down small slopes that are like mini waterslides towards the bottom. While locals flock here on weekends and holidays, there’s always plenty of space to lie out a mat and relax or walk along a 300-metre trail leading to different vantage points of the falls. The setting next to one of southern Thailand’s busiest trucking routes isn’t as depressing as it sounds. Here the road narrows and slinks steeply up to a forested area protected as part of the little-known Lamnam Kraburi National Park. Foreign visitors have to cough up 100 baht to go right up to the waterfall but, if just passing by, you can clearly see it from a car park where a few vendors sell food and drinks. 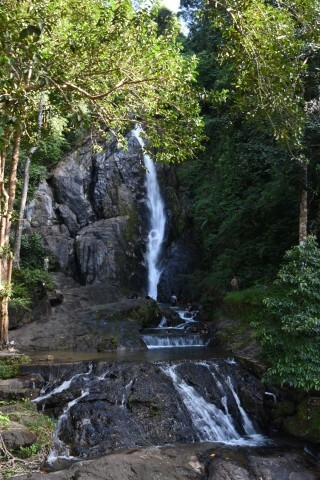 While Punyaban isn’t worth extending your trip for (hit Ngao Waterfall if you only have time for one), it makes for a lovely stop while on a day trip. From here you can continue a couple of kilometres further north and then cut left (west) on Highway 4010, a scenic road running back south alongside the vast Kraburi Estuary. Keep heading south and the road ends at Haad Chan Damri, where you could grab fresh seafood and hit a little viewpoint in front of Jansom Resort. Red songthaew number 4 picks up at Muncipal Market on Rueangrat Road and cruises up to the waterfall and back. Going on your own, simply take Phetkasem Road (Route 4) north out of town and you’ll see the waterfall on the right shortly after the road gets steep and curvy.